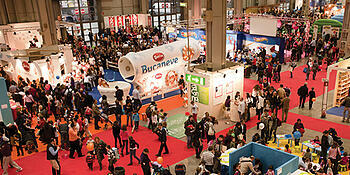 Trade shows are an integral part of a strong B2B sales & marketing program. Folks in the digital marketing world point to statistics around shifting budgets and attendance, but for the foreseeable future companies will continue to invest in exhibiting and attending - because there's value in doing so. However, shows are expensive. If you've ever had to review the drayage and utilities invoice from the Javitz, or sift through a stack of show travel and entertainment expense reports, you probably not only know, but FEEL the impact. So it's important to not just invest in the event, but to convert the event into a campaign. And inbound marketing offers the perfect tools to do that. Maybe that 3rd or 4th day of the show, you know the last one...the dead one, you've walked the show floor. Remember how your feet ached and booths sort of flashed by on either side? And that was at your show, for your industry, about which you're passionate. Imagine the visitor perspective wandering aisles full of people while his phone keeps ringing with crisis back at the factory. If you're banking on him simply stumbling into your booth with an open mind and eager to hear your pitch (which sounds remarkably like every other one he's heard), you're going to be disappointed. But don't fret. Not only do shows offer a variety of on-line tools (show planners, category filters, etc.) for which you can contract to be found, but solid content marketing provides the ability to turn a reasonably successful 3 day event into a very successful 6 week campaign. And by doing so to ensure that no matter how bad his feet ache, you'll be on the must see list of that weary show attendee well before he even heads for the airport to head to the show. Nobody cares which machine you'll be showing...even if it is the latest "V79CCX" version! And skip the press releases about how you'll be there. Again, nobody cares. Whatever you do, don't prattle on about your features or even benefits, and don't under any circumstances offer purchase discounts. Establish your credibility and relevance by fostering and participating in dialog and chatter about the event. A couple blog posts around industry trends and events written during the show, and social media engagement in real time during the event (in addition to your pre and post show updates) will position you as an active industry participant. Don't waste everyone's time with "Come visit us in booth 2947" drivel, but rather focus on topics that may not be directly related to your product/service, but will be of interest to folks at the show. And by all means use social media to promote your valuable posts and content around business problems and solutions (not products) to appeal to the growing number of Gen Y folks active in industry as well as Gen X advanced users of technology. Have you noticed how many folks wander the floor guided by their tablets or smart phones? And this content you create? Not only will it help drive qualified traffic to your booth and boost results among your leads, but it will create new leads for you for years - seriously. If you properly optimize your articles, posts press releases and even social media updates, you'll create an on-line lead generation asset with a long half-life.